With greater prevalence immunocompromised patients, CNS involvement is seen in up to 15% of cases of acquired immunodeficiency syndrome – related tuberculosis. CNS involvement usually results from hematogenous spread. CNS tuberculosis various common forms include tuberculous meningitis, tuberculoma, Calcified tubercular granuloma, Abscesses, and in spine osseous involvement is more common than non osseous spinal cord and spinal meningeal involvement. Diffuse or focal lepto meningeal enhancement. Tuberculosis of Calvarium and skull base. The most common manifestation of CNS tuberculosis across all age groups. Early diagnosis is important to reduce morbidity and mortality. Usually due to hematogenous spread but can also be secondary to rupture of a parenchymal focus or direct extension from cerebrospinal fluid. Imaging finding include exudates most pronounced in the basal cisterns seen as hyper density on CT and hyperintensity on MRI Flair. 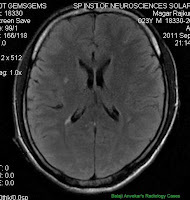 Abnormal enhancement of exudates particularly in basal cisterns, sometimes along meninges within the cortical sulci over the cerebral convexities and in the sylvian fissures. These findings are better seen at contrast enhanced MRI than CT. This appearance is nonspecific and has a wide differential diagnosis that includes meningitis from other infective agents; non infective inflammatory diseases such as sarcoidosis, patchy meningitis; and neoplastic causes, both primary and secondary. In subtle cases or milder and initial stages a non specific faint hyperintensity in the region of cortical sulci on FLAIR may be be the only finding. 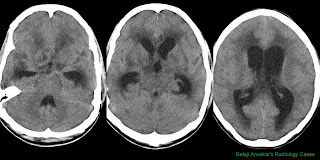 A) communicating hydrocephalus, caused by blockage of the basal cisterns or arachnoid granulations by inflammatory exudates. 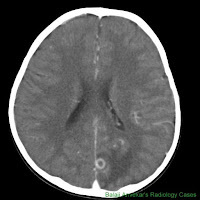 B) Occasionally, non-communicating hydrocephalus occurs due to the mass effect of a tuberculoma particularly at aqueduct or foramen of monro. C) Vasculitis induced Infarcts, also a common complication, in ~ 30% of patients, mostly within the basal ganglia, resulting from vasculitis of perforators, rarely direct vascular compression. Carries bad prognosis and seen multi drug resistant cases. D) Cranial nerve involvement , occurs in 17%–70% of cases, most commonly affecting the second, third, fourth, and seventh cranial nerves. Seen as abnormal enhancement along the nerve. Tuberculoma (tuberculous granuloma), the most common CNS parenchymal lesion of tuberculosis. This lesion may be solitary, multiple, multi locular or military. May be seen anywhere within the brain parenchyma, most commonly frontal and parietal lobes. Tuberculomas can exist in conjunction with tuberculous meningitis, although not a consistent combination. At CT, tuberculomas appear as round or lobulated lesion with low or high attenuation, homogeneous or ring enhancement, irregular walls of varying thickness. One-third of patients demonstrate the “target sign” (ie, central calcification or punctate enhancement with surrounding hypoattenuation and ring enhancement). This finding is suggestive of, but not pathognomonic for, tuberculosis. The MR imaging findings depend on whether the tuberculoma is caseating, and if so, whether the center is liquid or solid. It is thought that there is a progression from noncaseating to caseating and then from a solid to a liquid center. A noncaseating tuberculoma is hypointense relative to gray matter on T1-weighted images and hyperintense on T2-weighted images, with homogeneous gadolinium enhancement. Caseating tuberculomas with a solid center are isointense to hypointense on both T1- and T2-weighted MR images. They usually have a variable amount of surrounding edema, which is hyperintense on T2-weighted images. Caseating tuberculomas with a liquid center are hypointense on T1-weighted images and centrally hyperintense on T2-weighted images, with a peripheral hypointense rim on T2-weighted images that represents the capsule. 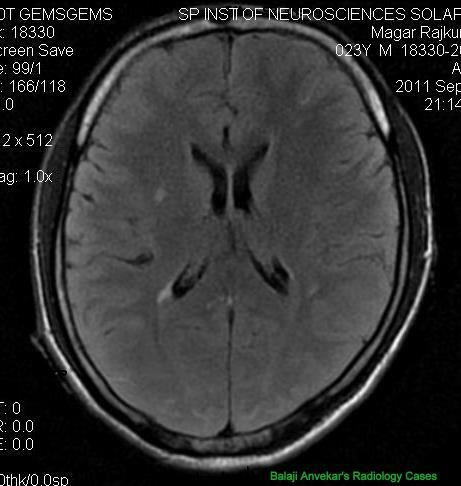 Rim enhancement is usually seen at gadolinium-enhanced MR imaging. Calcified tuberculoma or tubercular granuloma, after treatment, tuberculomas can completely resolve; however, calcification is seen in up to one-fourth of cases and is identified most clearly at CT as faint to dense nodular calcification with or without perilesional odema. Miliary CNS tuberculosis, usually associated with tuberculous meningitis, pathogenetic relationship is suspected. At MR imaging appears as multiple tiny (<2-mm), hyperintense T2 foci with nodular or ring enhancement. Tuberculous abscesses, are rarely seen and can be similar in appearance to liquid-centered caseating tuberculomas, although they tend to be larger and are more often multiloculated. At CT, these abscesses appear as hypoattenuating lesions with surrounding edema, mass effect, and peripheral geographic enhancement. Tuberculous cerebritis, occurs very rarely. The MRI is must for imaging. Findings ranges from CSF loculation, matting of the nerve roots of cauda equina or patchy dural or cord enhancement. Chronic lesions may not enhance. Syringomyelia as a complication of arachnoiditis. Axial FLAIR show effacement of cortical sulci in dependent portions of brain with hyperintensity in the region of cortical sulci, needs Csf analysis to rule out meningitis. Effacement of cortical sulci in dependent portions of brain with hyperintensity in the region of cortical sulci. 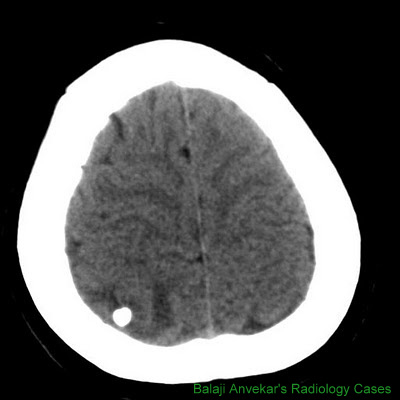 CT study showing hyper dense basal exudates with hydrocephalus and peri ventricular ooze of Csf. 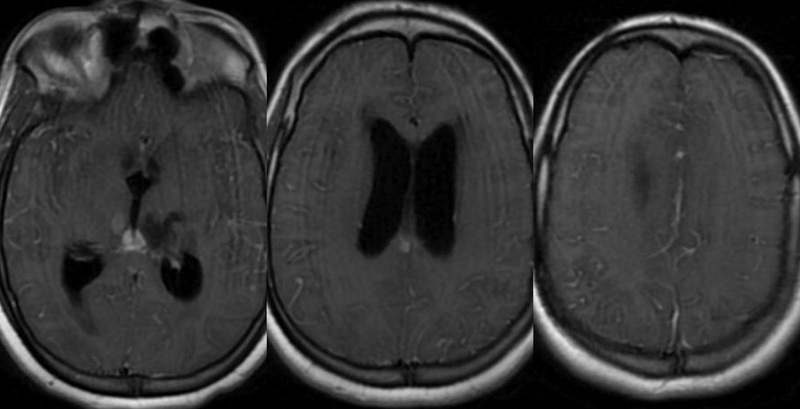 MRI Contrast enhanced T1w images showing enhancing basal exudates with hydrocephalus. MRI Contrast enhanced T1w images showing diffuse leptomeningeal enhancement with hydrocephalus and cerebral edema. A dense nodular calcified granuloma with mild perilesional odema. Tubercular abscess with multi locular ring enhancement. A known case of tubercular meningitis with Vasculitis on MR Angio and recent vasculitis induced infarcts.